I’d planned to paint the outside of the camper first, but after Dorothy and I cleaned out the inside yesterday inspiration struck there instead. 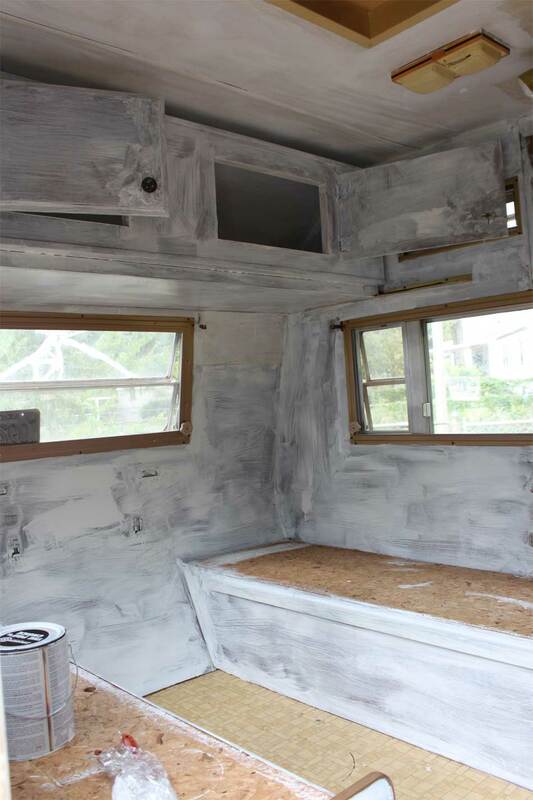 I’m not sure if there is more primer on the camper walls or me, but I’m having fun. This is the table and bunk area. I removed the table board to paint. The table board can be placed either table-height for eating, or level with the benches to make a large bed. The cabinets overhead can be used for storage or can be folded down to make a bunk bed, which Dorothy has already claimed as her own. I went back to the hardware store today for interior paint and selected these. 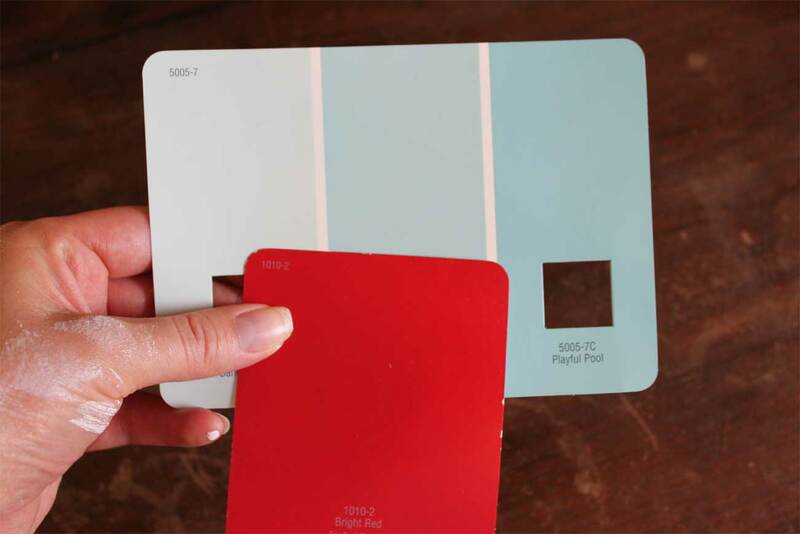 I’m going to paint the walls the middle shade of blue, and the cabinets (there is a wee kitchenette, not pictured) bright red. I love vibrant, true red, as anyone who witnessed my wedding already knows. Especially my lovely bridesmaids, dear folks, who wore shiny scarlet dresses in good humor. No apple or cranberry sidestepping for me, thank you. I found red with white polka-dot upholstry fabric for the bench cushions, and am planning to order one of the vintage camper prints with a coordinating red bandana fabric for the curtains. I hope Dorothy and I have as much fun camping in this tiny room as we’re having fixing it up! Oh my goodness! This is SO cute! I want one now! 🙂 Where did you end up finding this? Thanks Autumn! We got it outside Paducah. I responded to a bunch of Craig's List ads within a 300 mile radius before I found one that was in okay shape and not yet sold. Irritatingly, I went to a dealer around here and he told me that 10 foot campers "did not exist," or that at least he had never seen one in 40 years in business. What a jerk!